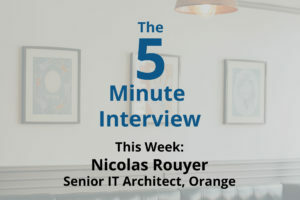 For this week’s 5-Minute Interview, I chatted with Nicolas Rouyer, Senior IT Architect at Orange in France. I caught up with Nicolas at GraphConnect Europe. 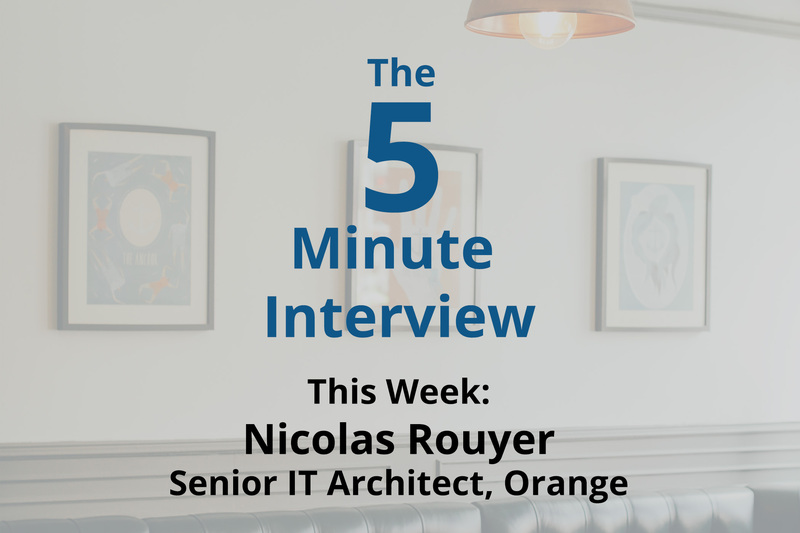 How do you use Neo4j at Orange, and what new projects are you working on? Nicolas Rouyer: At first, we started using Neo4j for IT supervision use cases. We at Orange Business Services recently issued a public offer to work with IT supervision for Fortune 500 companies. Internally, we use Neo4j to find security issues in our information system, and to give us a fresh perspective on IT. Most of the time we consider a server or network elements separately, but with graphs, you can connect them and have a bird’s-eye view of all its components. Why did you guys choose Neo4j? Nicolas: I was personally looking to solve search problems, such as shortest path, which was completely different from Orange’s other use cases. In looking for a solution, I went to a Parisian meetup and learned about Neo4j, which I saw as a potential solution with great added value for IT. Next, we found other possible use cases such as churn reduction, in telecom companies and training recommendations for human resources, as well as use cases transposed from telecommunications to human resources. For example, churn reduction could be adapted to human resources because if we know the interactions between employees, we can gain insight into certain communities. Nicolas: Well, most of the time, we find things we hadn’t thought of. The IT connections were very apparent in our minds, but in the graph, the IT connections can be stored more concretely. Sometimes, the graph database works better than our brains. But we dig into the IT systems, establish relationships and refine the graphs. The first data model may not work, but we refine it until it’s a good reflection of reality. 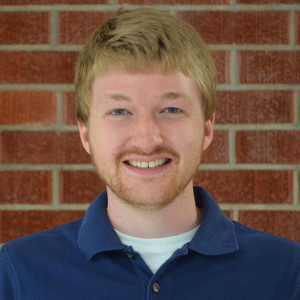 Nicolas: I would pinpoint on data modeling. I think it’s the most important thing with both NoSQL in general and with graph databases in particular. You first have to know what data model to use and then just draw it out on a whiteboard. The working graph is not that important because your model can be a failure at the beginning, and you can also refine the model later on. Also, when we were first working with Neo4j, we tried to integrate all the software together with the ETL and graph database at the core with some business analytics tools like Tableau, QlikView, QlikSense and so on above that core layer. We managed to build all those connections and did them quite well. But now that we have a more mature user’s point of view, we can offer them adequate and dedicated interfaces which we develop more easily with Spring Data and so on. So maybe if we’d gone back to the beginning, we would have potentially used more open source frameworks to ingest and visualize the data. Any closing thoughts you’d like to add? Nicolas: I live in Toulouse, in southwest France, and we have a great growing community of graphistas (more than 300! ), and we welcome anyone who is interested. After a few years, the community is more mature now, and for example, we were able to develop practical workshops that allow people to dig into Cypher, as well as open data. After one of our workshops, we wrote a graph use case on open food facts. I think these are signs that this community in Toulouse is growing fast, and we love learning more about graphs. Dive deeper into how graph databases transform your data center and network management operations – click below to download this white paper, How Graph Databases Solve Problems in Network & Data Center Management, and start solving your IT challenges with graph databases.